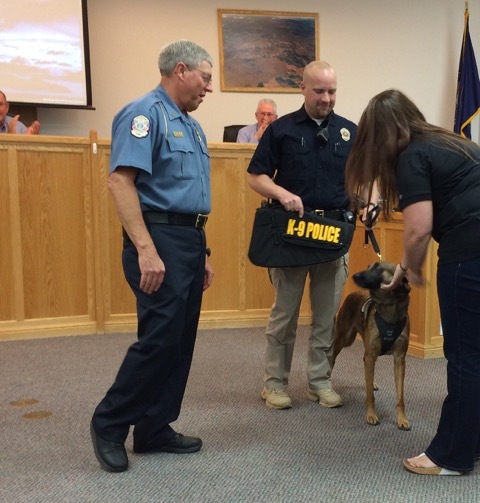 HURRICANE – September Smith, Because Animals Matter president, made a presentation to Hurricane City Council and the Police Department in the form of a custom fitted K-9 service vest. 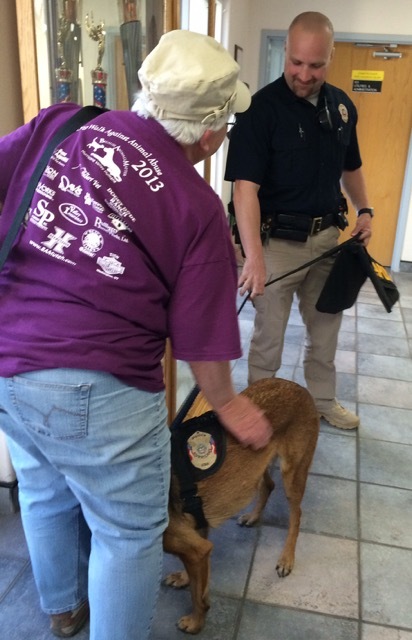 Because Animals Matter, or BAM, decided to put money into action in support of the Police Department’s first K-9 officer, Paige. 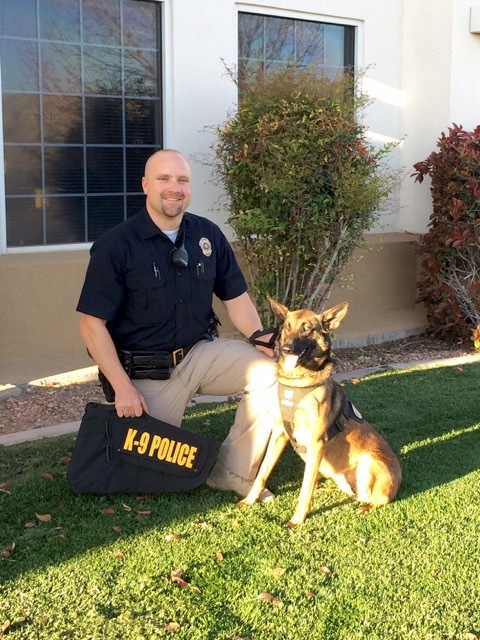 Paige is a 4-year-old Belgian Malinois trained in narcotic detection and criminal apprehension. BAM also continues to support training of Washington County Sheriff’s Search and Rescue volunteer K-9, BAM said in a release. 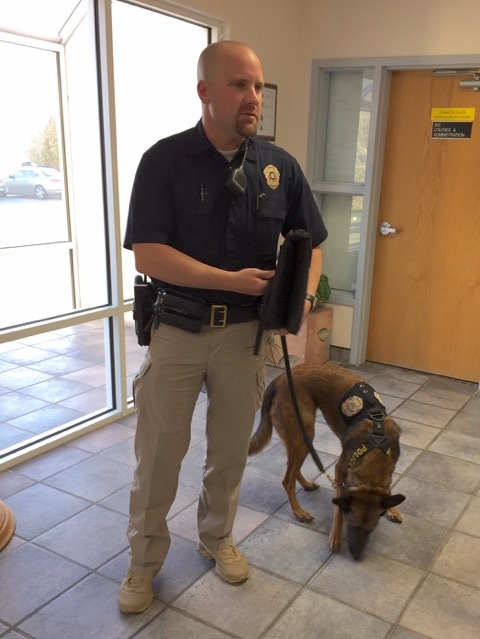 According to a release issued in 2013, BAM donated two sets of pet oxygen masks to Hurricane’s Fire Department, and their annual Dog Day Spectacular (held each September) has supported the continued training of Washington County Sheriff’s Search and Rescue volunteer K-9 team in past years. 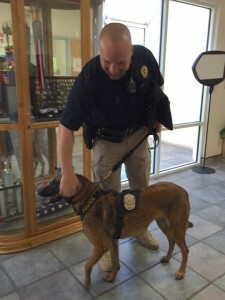 BAM also has a Kibbles on Wheels program aimed at homebound and elderly pet owners who may not have the resources to purchase dog or cat food on a regular basis, and may, in turn, be compromising their own diet, Smith said. BAM is currently looking to expand the KOW program and for a volunteer to head or co-chair that program. If you are interested in volunteer opportunities please contact BAM at 435-773-5209 or by email. For more information about Hurricane’s K9 Program, telephone 435-635-9663. Paige, you are a beauty and look great in your uniform. I’m so glad you got your vest.